For the first time a high-resolution map over the ground below the Greenland ice sheet is available. Researchers at Uppsala University have developed the map that will be of great importance for future possibilities to predict how the Greenland ice sheet melts and moves and that in turn has an impact on rising sea levels as a result of climate change. ‘We are the first to present such a detailed map. The previous maps of the area have a resolution of one kilometre with large data gaps. Our new map has a resolution of 150 meters’, says Katrin Lindbäck, doctor in glaciology at the Institute of Earth Sciences at Uppsala University. The new map, covering 12,000 square kilometres in West Greenland, will give new opportunities to do research on, for example, how the meltwater from the ice surface travels down through the ice and ultimately reaches the sea through glacial rivers. ‘The water does not come out at the ice front at the same places as it would if it had travelled on the ice surface. Where it ends up is determined by the ice surface slope, but also by the topography and the water pressure under the ice. The drainage basins can change and shift over a melt season depending on how much water that melts on the ice surface’, says Katrin Lindbäck. The water that reaches the glacier bed works as a lubricant between the ice and the bedrock and sediments, and affects ice movement. That in turn affects the global sea level rise. The map has been developed by combining existing data with data collected in the project through radio-echo sounding from snow mobiles. Research colleagues in Denmark have measured the amount of meltwater and runoff on the ice surface with automatic weather stations, and this has been compared with discharge data from the outlet rivers in front of the ice sheet. To be able to compare the two quantities a map over the subglacial drainage basins is needed. This has not been available before, and this map is the first of its kind. Before many studies have just assumed that the water follows the ice surface, but now it is possible to see the drainage basins under the ice sheet, says Katrin Lindbäck. Greenland ice sheet is losing mass, which can contribute significantly to rising sea levels on Earth. The warmer climate leads to an increased melting of the ice surface and an acceleration of the ice flow. The latter phenomenon is called dynamic thinning and is caused by the ice sliding and calving at a faster rate, resulting in a greater mass transported from land to sea. The increased sliding at the base is due to more melt-water from the surface reaching the bedrock, but the mechanisms behind this phenomenon are poorly understood. The thinning of the ice has now been observed at all latitudes in Greenland. Thus, the ice’s potential impact on sea levels within the next hundred years is very difficult to estimate and this is a major uncertainty in current climate models. The temperature in the Arctic and Subarctic is expected to rise by 3-5 °C over the next hundred years. Today's models indicate that Greenland is most likely very sensitive to increased temperatures, but to predict the melting rate is very difficult when key processes are not clarified. Today it is estimated that sea levels will rise by half a meter before the year 2100, which will affect nearly 500 million people living in coastal areas around the world. Would the entire Greenland ice melt will increase sea levels by seven meters. 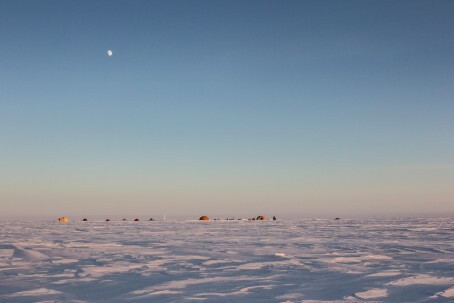 Ground-penetrating radar measurements have been collected to determine the subglacial topography and subglacial thermal conditions in detail. In the project there are also continuous measurements of ice movement with GPS-stations, passive seismic at the openings of englacial drainage paths and there are a number of weather stations on the ice for the modelling of melt-water production. Katrin Lindbäck recently summarized her research in her PhD thesis with the title "Hydrology and Bed Topography of the Greenland Ice Sheet: Last known surroundings". The PhD thesis was defended last Friday, September 11.